When it comes to choosing the right bridal hairstyle, every bride starts looking for ideas and inspiration, it is always a great idea to show your hair stylist a picture or two of the bridal hair you would like to have on your wedding day. 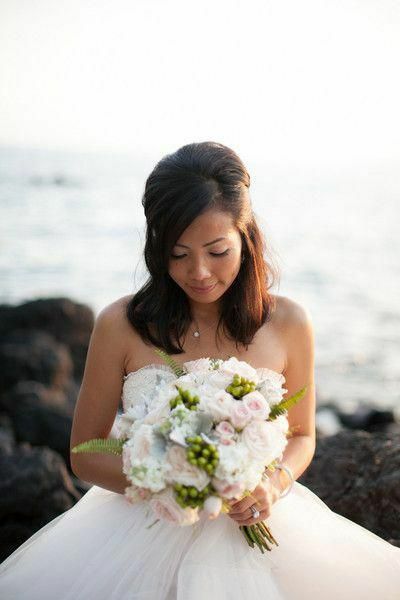 Bridal updos depend on many details, such as the hair length, hair type, the style of the wedding dress, and of course the bride's personality. We always advise brides to be to have a hair trial before their wedding day just to make sure that she chose the right hairstyle and that her hairstylist will do a good job on the day of the wedding, because the last thing you want on your big day is to be surprised with a hairdo that you hate. Many brides choose to grow their hair before their wedding day while other don't mind having short hair for their big day, and we think that no matter what your hair length is, you should always look for a bridal hairstyle that will work well with your hair length. Medium hair length is always a safe and great length for brides, as there are many hairstyles that can be worked on medium length hair. And at Arabia Weddings we always bring you the latest bridal hair trends for you to check out before your wedding day. If you are a bride to be with medium hair length then you will love these wedding hairstyles for medium hair, whether it is a half do or a full updo these hairstyles suit all bride to be and many wedding dress styles. Choose your favorite hairstyle and show it to your hairstylist and make sure you are both on the same page before your big day.